Thank you Robin! Yes, I love that photo, because I know it’s him. My grandmother verified it 30 years ago, and I have another photo of him to verify that it’s the same man. And, his name is on the photo caption, which I cut out of the shot I posted here. Also, I forgot to add that, the small town I live in here in PA (1300 pop. ), still has their own band. The practice hall is half a block from my house, and in the warmer weather, one can here the music because they open the doors. Ah, tonight is their practice night! Maybe I will hear them. I might consider auditioning for them (on clarinet) when I retire. @jimmy-lamar That's a great photo! I know music is in my blood, although it skipped a couple generations. 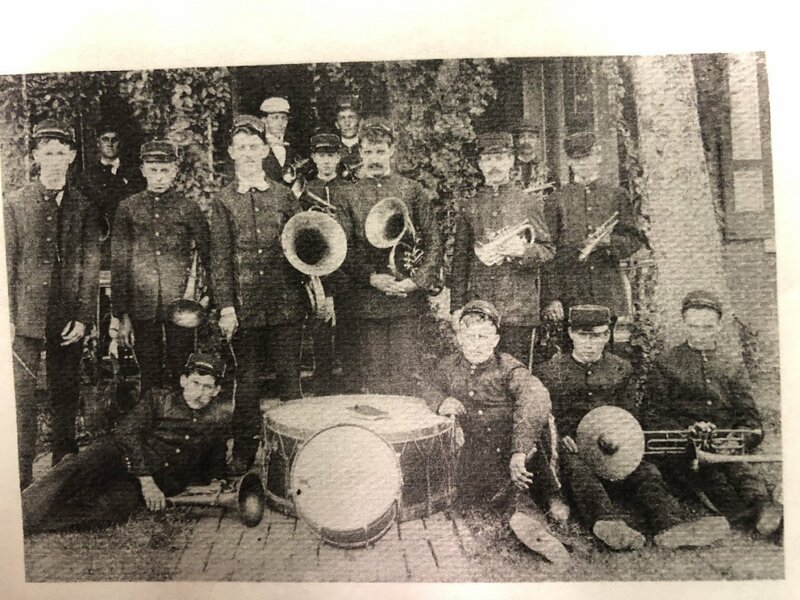 This pic shows my paternal great grandfather who was the band leader. He is on the far left in the back row (kind of in the shadows). I don’t know if he played an instrument for sure, but he probably did. If he did, it was probably a cornet. I just noticed something this morning. If you look closely around his belt line, it appears that there might be a bell of some horn there. I never looked at it closely until today. I always thought it was a pocket watch chain. This was a small town band, which, as many of you know, were quite popular during this time period. I am not certain of the date of the photo. If I had to guess, it was around the late 1890s-1910. My great grandfather was a home builder and carpenter by trade. Very cool photo, Charles. I was going to say something similar to Strumelia's comment (though I certainly couldn't identify the date of the photo by the clothing -- wow!. Bluegrass was invented in the 1950s, so these guys were some kind of string band. Think of Charlie Poole and the North Carolina Ramblers, although that trio used a banjo instead of a mandolin. If you want to hear what they might have sounded like, Columbia Records put out a 2 CD compilation of stuff that was originally released on old 78s from the mid 20s to the mid 30s. The CD is called White Country Blues. I highly recommend it. I wish I could have heard them play! Yep, I was going to say Albert Hoffman as well, without seeing the other replies. Charles, I think this is between 1925-1935 judging from the collars and clothes and the photo itself. 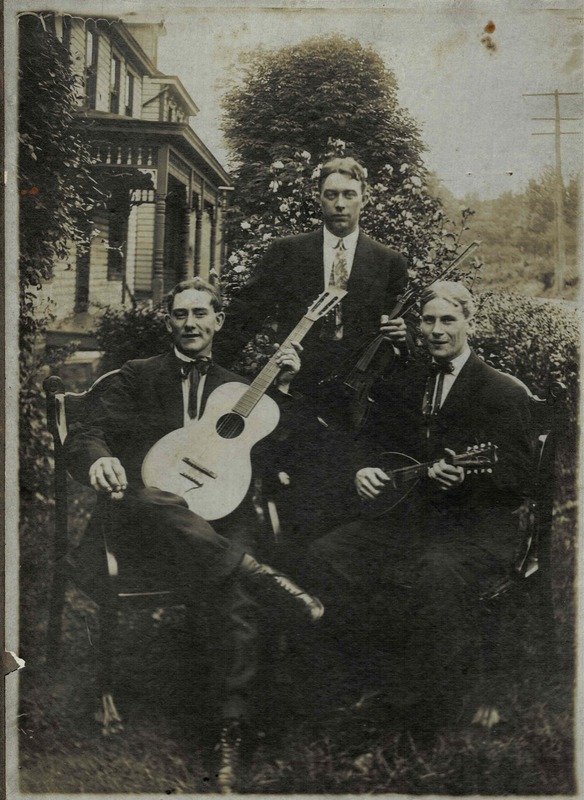 There was no bluegrass yet, but maybe they were doing some country/hillbilly/fiddle style stringband stuff of the time- it was popular on 78 rpm records. Also Jimmy Rodgers was big- 'blue yodeler'/country railroad blues. Thanks everyone! I can see it now! Albert Hoffman! Neat photo of the trio, Charles! I agree with Robin...it looks to me like Albert (?) Hoffman. I agree with the Hoffman part. Could be Albert. I took a look-- looks like Albert Hoffman to me. You've got a great photo, Charles-- a treasure! Thanks, Ken! I couldn't make out the first part, but it looked like on the second part a capital S and maybe a T or L and then Affman. It's not a name I recognize from my family, but the mandolin player looks like my brother. That's a good looking group of fellows. I couldn't make out writing, so I'll take your word for it. Thanks for sharing this unique find. This old photo hangs on my "studio" wall. I found it in an old shoe box of family photos. It looks like it was taken in the 1930's, by a pro ( it's mounted on cardstock with decorative borders ). They look like a bluegrass trio with a fiddle, mandolin and guitar. The only other information is written in pencil on the back. I can't quite make out what it says..."Staffman" maybe? I think it's a cool photo and it inspires me.